and the asm listing for a PIC 16F648A program to drive a red, green, and blue LED so it displays the color selected on the PC. col_pic is an X11 program, intended to work with the PIC based hardware running col.hex, to drive 3 LEDs, red, green, and blue, to create a controlled color lighting. It sends color commands via a serial port. col_pic-0.7.4 also has UDP support for use with the ethernet based color controller ecolor_pic. Click here to download col_pic-0.7.4.tgz. Click here for the lsm info file. Do not forget to ground pin 10 RB4/PGM to prevent low voltage programming mode. For this version F should be set to 237 and C to 65 to get the clock speed approx right, fine tune with F.
For changes see the asm source. Click here to download col-0.7.4.asm. Click here to download col-0.7.4.hex. Here is the diagram, simple, almost any NPN transistor will work in the output, the base resistors can be 4k7, you could use low voltage Vgs on MOSFETS too. Here is the little thing build into a box. 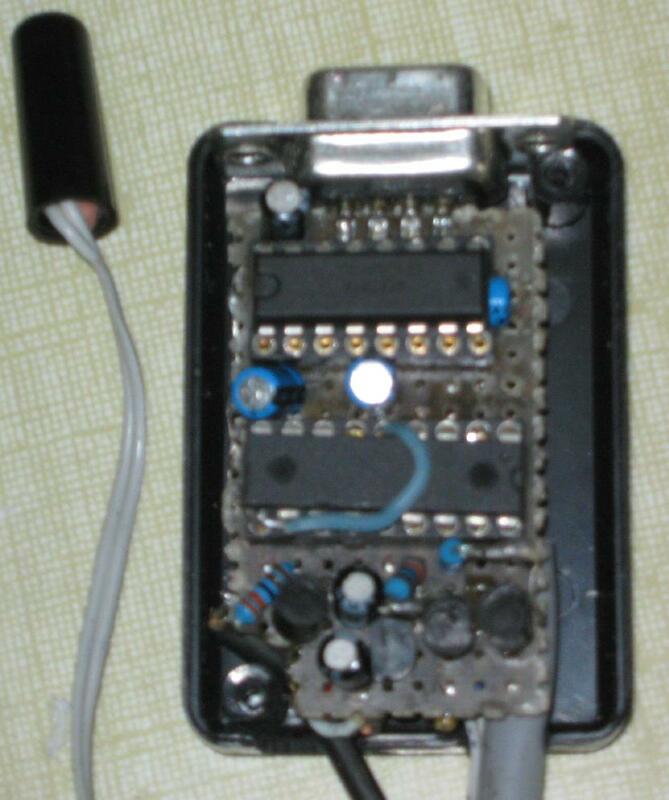 The black thing on the left is a connector with the LDR mounted in it, the grey cable goes to the LED strips via a 5 pol 180 degees DIN connector, and the black cable is the +12V input for a battery or DC adaptor. It is possible to use the col.hex with a simple terminal program, and / or to change color over time from a script for example. Click here to download ptlrc-0.3.tgz. NEW: xpequ now supports col_pic making music driven disco lights! This will set red, green, and blue to maximum at 15:49, to 255, 55, 5 at 15:50, and to 5, 55, 255 at 15:51.
crond must be running for this to work. So now you can even simulate a rising sun in your bedroom to wake you up, have special sphere light in the evening too, all automagically. Col.hex now has a 24 hour clock, and 5 programable timers. There also is a fast mode, where the clock runs at very high speed, 24 hours in a few seconds, that can be used with the timers for flashing light effects. D set clock prescaler1 and clock speed defaults, deselect fast mode. MnnENTER set minute, range 0-59. 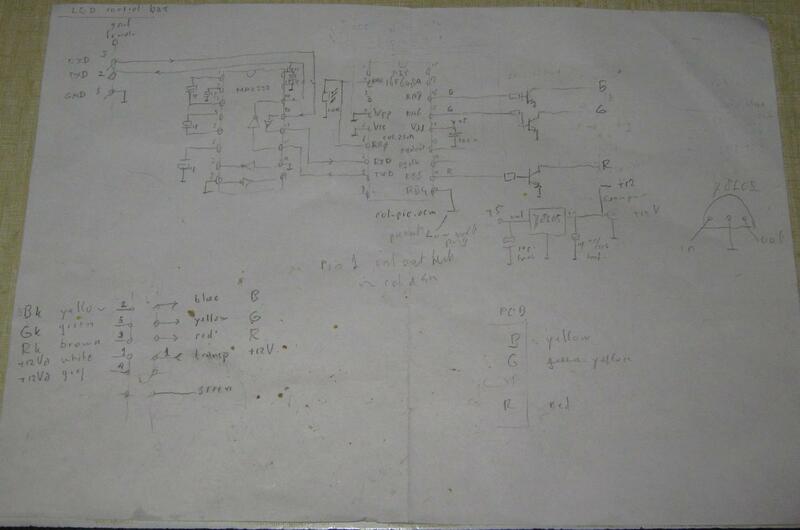 PnENTER program timer number n, n is range 0-4. will ask for hour, minute, red, green, blue, timers saved in EEPROM. s sends back R, G, B in the form of 3 integers. ENTER stands for code 10 (LF) or code 13(CR). Red LED pin 18 via a 220 Ohm resistor to +5V. Green LED pin 17 via a 100 Ohm resistor to +5V. Blue LED pin 16 via a 1000 Ohm resistor to +5V. RX data (via for example a MAX232 chip) to pin 7. TX data (via for example a MAX232 chip) to pin 8. Gamma correction and driving RGB color LEDs with PWM from a color table. then that color table *normally* is used to set the DAC in the graphics card. has a function of brightness versus drive voltage of y = x ^2.2. y = x^(1/2.2), so that it looks correct on a CRT or LCD monitor. values with y = x^(2.2). That is why the gamma correction button, you can specify other values for gamma too.